As soon as I saw this recipe in the magazine I ripped out the page and pushed it to the top of my recipe list. Chocolate-caramel and a cookie base, what could be bad, right? Well. I wanted to like these. And I was sure I would like these. But I didn’t. The crust was good but the chocolate caramel was just too sweet for me. WHAT? I know, I can’t believe I said that either. I don’t think I’ve ever referred to anything as too sweet. Has you tried these? What did you think? Preheat oven to 350 degrees. Make the crust: Line a 9-inch square baking pan with parchment, leaving an overhang on all sides; butter parchment, excluding overhang. Beat butter and brown sugar on medium speed until pale and fluffy, about 3 minutes. Add flour and table salt, and beat until just combined. Press dough evenly into pan, and bake until lightly browned, about 30 minutes. Make the chocolate caramel: Place chocolate in a medium bowl. Heat granulated sugar and water in a small saucepan over medium-high heat, washing sides of pan with a wet pastry brush to prevent sugar crystals from forming, until amber, 10 to 12 minutes. Remove from heat. Add butter, cream, and table salt. Bring to a boil, stirring until smooth. Pour over chocolate. Let stand for 2 minutes. Stir to combine, and let stand until cool, about 10 minutes. Pour mixture over crust. Refrigerate at least 4 hours, or overnight. 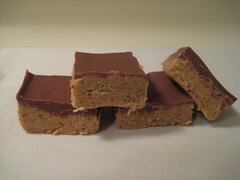 Run a knife around edges; lift parchment to remove whole bar from pan. Sprinkle with sea salt. Trim edges, and cut into 16 bars. Bars can be refrigerated for up to 3 days. Have you ever read reviews of a five-star recipe that everyone is raving about it and then gotten excited to make it, because you know it’s going to be spectacular and your coworkers will just love it? OK good, I thought you have. But have you ever made the five-star recipe that everyone is raving about only to be incredibly disappointed and left wondering HUH? This is one of those recipes. I took the bulk of the reviewers suggestions and implemented them only to find the end result very eh. The cookie is an ooey, gooey mess of oatmeal, too much chocolate (I know, I never thought I would utter those words either), and a thin layer of caramel. Disappointing. And I’m guessing there will be some left at the end of the workday tomorrow. Preheat oven to 350 degrees F (175 degrees C). Butter a 9×13 inch baking pan lined with foil or parchment paper. In a medium saucepan over low heat, melt together the caramels and heavy cream, stirring occasionally until smooth. 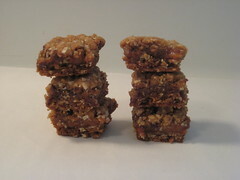 In a medium bowl, stir together the flour, oats, brown sugar, baking soda and salt. Stir in the melted butter until well blended (I used my hands). Press half of the mixture into the bottom of pan. Reserve the rest. Bake the crust for 15 minutes in the preheated oven. Remove and sprinkle with chocolate chips. Pour the caramel mixture over the top and then crumble the remaining crust mixture over everything (I used my hands to pat the mixture down). Return to the oven and bake for an additional 20 minutes, or until the top is lightly toasted (you may want to check it around 15 minutes). Cool then cut into squares. Chocolate and peanut butter–the two great tastes that always taste great together, right? Wrong. I know, I know, you didn’t think it was possible. Neither did I, until I made these. But they’re terrible. I mean, really, really terrible. The peanut butter base is mushy and gritty and the overall texture is just ick. After I got over my initial disappointment, I Googled the recipe and found rave reviews which totally surprised me. Have you made these? What did you think? Stir all the ingredients for the base together until smooth. I use the paddle attachments to my mixer, which my children love operating, but a bowl and a wooden spoon will do the job just as well. You will find, either way, that some of the dark brown sugar stays in rubbly but very small, lumps, but don’t worry about that. Press the sandy mixture into a 9-inch square brownie pan and make the surface as even as possible. To make the topping, melt the chocolates and butter together (in a microwave for ease, for a minute or two on medium) and spread the base. Put the pan in the refrigerator to set. 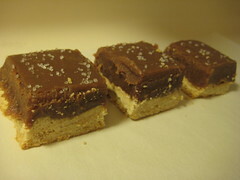 When the chocolate has hardened, cut into small squares because, more-ish as it undeniably is, it is also very rich. 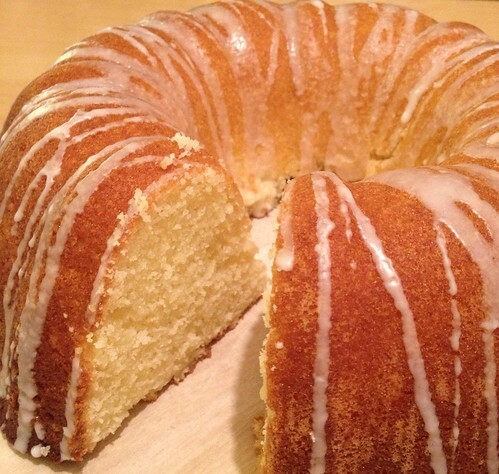 Recipe from How to Be Domestic Goddess via WCHS. The minute I began making these I had a feeling it was going to be a disaster. As I reviewed the ingredients I was a little surprised by the egg whites the recipe called for. I’ve made marshmallows twice, both times sans eggs (recipes here and here) and they were super easy and delicious. This time however, no such luck. Here’s a quick rundown of my problems. First, I measured out all of my ingredients ahead of time as I always do yet I somehow ended up with an extra tablespoon of sugar and read the recipe about 10 times trying to figure out when and to what I should have added it. I eventually just threw it in with the egg whites. Next, because of the Hot Sugar Blister Incident of 2008, there was no way in hell I going to pour 265 degree boiling sugar into a mixer on medium speed. Adventurous when it comes to recipes, maybe; crazy, I am not. So instead, I put the mixer on low and poured the boiling sugar into the egg white and then–I smelled scrambled eggs. I kid you not. By now, I was 99% sure this was going to be a failure but I continued on, committed as always, and followed the rest of the steps. I let the mixture (which somehow looked correct) sit out on the counter overnight but the next morning, it was bad. Gooey and globby and slimey and not what marshmallows should look like. I suppose I should also note that I live in southern California and being as we had record high temps this past weekend (95 degrees in Hollywood, insane! ), I didn’t really have a “cool, dry place” to let the marshmallows set. Perhaps that contributed to the disaster? And so, it is safe to say that the next time I feel the need to use the whisk attachment of my KitchenAid, you better believe I will be using an eggless marshmallow recipe. GETTING READY: Line a rimmed baking sheet — choose one with a rim that is 1 inch high — with parchment paper and dust the paper generously with potato starch or cornstarch. Have a candy thermometer at hand. Put 1/3 cup of the water, 1 1/4 cups of the sugar and the corn syrup in a medium saucepan over medium heat. Bring the mixture to a boil, stirring until the sugar dissolves. 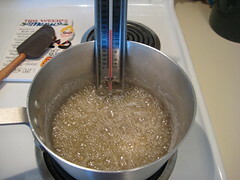 Once the sugar is dissolved, continue to cook the syrup — without stirring — until it reaches 265 degrees F on the candy thermometer, about 10 minutes. 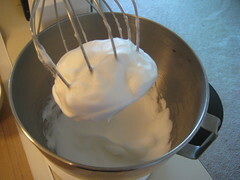 Working in the clean, dry bowl of a stand mixer fitted with the whisk attachment or in another large bowl with a hand mixer, beat the egg whites on medium-high speed until firm but still glossy — don’t overbeat them and have them go dull. Using a large rubber spatula, scrape the meringue mixture onto the baking sheet, laying it down close to a short end of the sheet. Then spread it into the corners and continue to spread it out, taking care to keep the height of the batter at 1 inch; you won’t fill the pan. Lift the excess parchment paper up to meet the edge of the batter, then rest something against the paper so that it stays in place (I use custard cups). Dust the top of the marshmallows with potato starch or cornstarch and let the marshmallows set in a cool, dry place. They’ll need about 3 hours, but they can rest for 12 hours or more. Once they are cool and set, cut the marshmallows with a pair of scissors or a long thin knife. Whatever you use, you’ll have to rinse and dry it frequently. Have a big bowl with the remaining potato starch or cornstarch at hand and cut the marshmallows as you’d like — into squares, rectangles or even strips (as they’re cut in France). As each piece is cut, drop it into the bowl. When you’ve got 4 or 5 marshmallows in the bowl, reach in with your fingers and turn the marshmallows to coat them with starch, then, one by one, toss the marshmallows from one hand to the other to shake off the excess starch; transfer them to a serving bowl. Cut and coat the rest of the batch. *Where does this extra tablespoon go?! SERVING: Put the marshmallows out and let everyone nibble as they wish. Sometimes I fill a tall glass vase with the marshmallows and put it in the center of the table — it never fails to make friends smile. You can also top hot chocolate or cold sundaes with the marshmallows. STORING: Keep the marshmallows in a cool, dry place; don’t cover them closely. Stored in this way, they will keep for about 1 week — they might develop a little crust on the outside or they might get a little firmer on the inside, but they’ll still be very good. RASPBERRY MARSHMALLOWS: Fruit purees are excellent for flavoring these candies. For raspberry marshmallows, you’ll need a generous 1/3 cup of puree; reduce the vanilla extract to 1/4 teaspoon. After the batter is mixed, gently fold in the puree with a rubber spatula. You can use the same measurements and technique for other purees, such as strawberry, mango and passion fruit. Makes about 1 pound marshmallows.